In spite of recent advances in radiation therapy and combination chemotherapy, patients with relapsed non-Hodgkin’s lymphomas are currently incurable with conventional treatments. Investigators at many institutions, including our own, have studied the potential of supralethal doses of chemoradiotherapy in conjunction with allogeneic or autologous bone marrow transplantation to cure patients with relapsed lymphomas [1–12]. 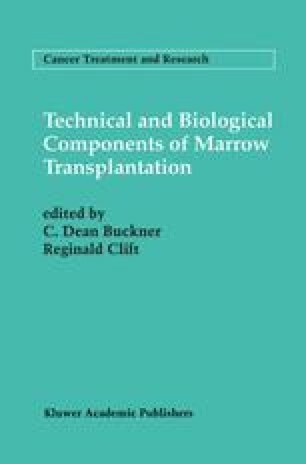 A variety of marrow transplant conditioning regimens have been investigated, including high-dose cyclophosphamide plus total body irradiation (TBI); busulfan plus cyclophosphamide; busulfan, cyclophosphamide, and TBI; TBI and high-dose cytarabine; cyclophosphamide, bis-chloroethyl-nitrosourea (BCNU), and etoposide; and cyclophosphamide, etoposide, and TBI [1–12]. None of these regimens has demonstrated clear superiority. Most regimens yield long-term disease-free survival rates of 40–50% for patients transplanted in early first relapse or second remission and 10–20% for patients transplanted with more advanced disease. Although these results are superior to those achievable with any standard chemotherapeutic approach, over half of the transplanted patients still die of lymphomatous relapse. Further dose escalation to decrease relapse rates is not feasible because of lethal toxicities, such as interstitial lung disease, veno-occlusive disease of the liver, and renal failure, which kill 5–15% of patients treated with existing regimens.